At some prisons where I worked, mealtimes were called “chow.” I often wondered what dinner would be like if the lights were lowered, if the inmates were seated around tables with tablecloths, and if the meal was served family style. It would be quite different from how the prisoners normally formed regimented lines to get their food, ate quickly to make room for the next group, and had very little conversation. Jesus ate sitting at tables; sometimes He ate on a grassy hillside or along the shore. He would give thanks to the Father. Those whom He ate with were nourished in body and soul. And He often used the vocabulary of bread, food, and drink to speak of His humanity, of His flesh which He gave for the world. Taking Jesus in—being nourished by Him—is like eating good food. After the resurrection when Jesus’ followers were grieving, they recognized Him as He sat at the table, gave thanks, broke the bread, and offered it to them. 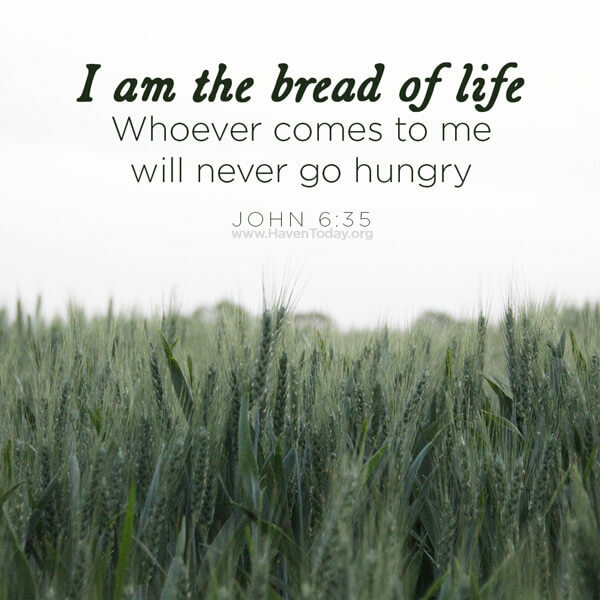 Say a prayer at a meal, have some conversation, and thank Jesus for being your Bread of Life.